The University of Tasmania is honoured to announce that alumna Professor Jane Pirkis, a world-renowned population mental health researcher, has received the Distinguished Alumni Award for 2017. Professor Pirkis is one of Australia’s foremost mental health researchers, and her work has shaped suicide prevention policy, led to the creation of prevention structures in commonly used suicide locations, and informed international media guidelines on how to report on suicide. Her work has been used by advocates to successfully implement these life-saving structures and other preventative measures in Australia, Canada and the UK. The award was presented last night at the Launceston University Dinner held at the Hotel Grand Chancellor among distinguished guests, University of Tasmania staff, scholarship recipients and alumni, and members of the community. “I would like to thank three lecturers at the University of Tasmania who were very influential during my time there, Professors Bill Lovegrove and Don Mc Nichol and Doctor John Trinder, who were all amazing and inspirational psychology lecturers,” she said. She also thanked her long-term friend, fellow University of Tasmania psychology graduate, alumnus and lecturer at the University of Tasmania, Professor Andrew Heathcote, for nominating her for the award. Currently the Director of the Centre for Mental Health at the University of Melbourne, Professor Pirkis has forged a stellar career as a researcher, having continuously held National Health and Medical Research Council fellowships since 2003. Her remarkable career started as a psychology undergraduate at the University of Tasmania with a Bachelor of Arts (Hons,1986) and a Master of Psychology (1990), before going on to study a Master of Applied Epidemiology (1995) at Australia National University and a PhD (2001) at the University of Melbourne. Professor Pirkis has conducted significant research into media suicide reporting and identified that irresponsible reporting on suicide can lead to imitative acts. Her groundbreaking research has informed Australian and international media guidelines on safer ways to present suicide-related stories. She also worked in partnership with the Movember Foundation and Heiress Films to create ‘Man Up’, a documentary on the topic of suicide and masculinity, screened on the ABC in 2016 and watched by millions. Among her many remarkable achievements, Professor Pirkis has undertaken a number of evaluations of large-scale suicide prevention programs and mental health care initiatives. She has attracted nearly $50 million in research funding over the course of her career, published endless journal articles and also currently reviews many national and international grant programs. Passionate about building the next generation of suicide prevention researchers, Professor Pirkis has supervised 26 PhD students and over 50 young researchers, many of whom have gone on to carve out successful careers as independent researchers or practitioners. In addition to her incredible contribution to academia, Professor Pirkis is the General Secretary of the International Association for Suicide Prevention, and has been awarded a string of prestigious awards in recognition of her vast contributions to the field, including Suicide Prevention Australia’s Lifetime Research Award in 2010. “Professor Pirkis is to be celebrated for her outstanding achievements both academically and professionally, and particularly for her contribution to mental health research and the public health sector,” University Vice-Chancellor Professor Peter Rathjen said. “Her tireless efforts have benefitted communities across the globe and almost certainly saved lives, and the University of Tasmania is honoured that her journey started here,” he said. Returning to the Newnham Campus for a media opportunity yesterday also signified a return home for the professor, as she spent part of her childhood living on campus where her father taught at the (then) Tasmanian College of Advanced Education. 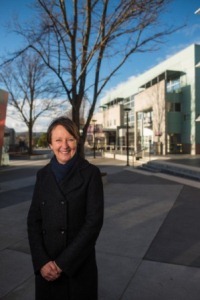 The University of Tasmania is honoured to have Professor Pirkis as one of our alumni, and proud to be recognising her achievements in the awarding of the Distinguished Alumni Award for 2017. Her work has made a major contribution to the field of suicide-prevention and has almost certainly contributed to saving many lives.